Dave bought me this recipe book for a birthday present as we both enjoy watching James Martin cook. Not only is he very good looking, owns a few great cars and motorcycles, grows his own vegetables, he is an awesome chef. The Collection has 300 classic recipes over a 400 page spread, with an amazing collection of photographs as well as stories behind the dishes. This is a collection of British Foods and I have made use of a few of the recipes in the book on numerous occasions. The recipe book starts with breakfasts and then moves onto soups. The section I want to experiment from most is the salads, terrines and pâtés chapter but first I need a terrine dish. Lucky for me, since writing this draft, Dave has purchased a terrine for me from Le Creuset as my birthday present. This chapter is followed by grills and fry-ups and as soon as I can get some sausage skins I will be making Cumberland sausage. The following section is pies and tarts and then roasts. I always make use of James’ hints for getting the crackling correct when making my roast pork. Stews, pots and spicy foods is the next thing to look forward to and you will really enjoy making James’ quick chicken tikka masala. Pasta and rice follows this and then comes the fish. This chapter is followed by one on shellfish and then a chapter devoted to vegetarian meals. For my vegetarian readers, this section has 9 recipes, and is followed by recipes for vegetables. James dedicates a section to sauces and I should have referred to this when I made my barbecue sauce. Sweet baby James as he is also known as has not left the cook wanting for dessert options and the second half of the book starts with sweet pastries and fritters. Next he serves up fruit puds which includes his trademark spun sugar. This is followed by steamed and sponge puds and then cream, eggs and vanilla. The next chapter is devoted to ices and then we get to the cakes, followed on by biscuits. 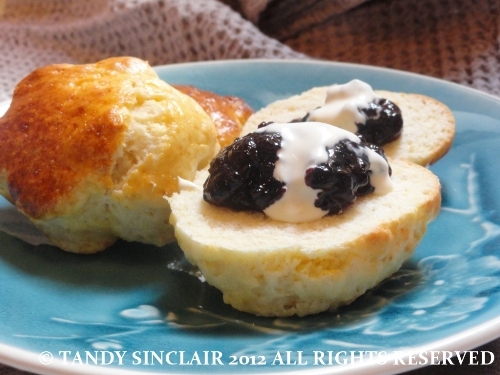 The chapter on bakes starts off with scones. The next chapter is chutneys, jams and jellies and the book ends with sweets and treats. I love this book for its ease and simplicity, and because there is more than one recipe in it I have tried, and a lot more I want to try. It has been signed for me, and has a special place in my kitchen. This marks the start of a new lot of recipe book reviews which I have neglected of late. I chose to start with a book I already own. Look forward to reading what you make from this wonderful book Tandy. James Martin is worth reading. He has good ideas, tips and cool recipes. and very worth watching as well!